Yes I was an 80’s child and I had my very own Teddy Ruxpin with a cassette player for a belly so he could read me stories at night, unfortunately mine fell out of bed and his eye fell out! Oh well good memories. 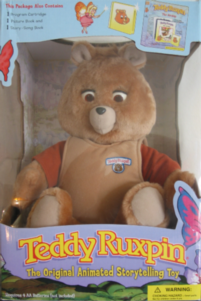 Teddy Ruxpin came out in 1985 and has made several attempts of a comeback since, but I think he was trumped by Furbies, Barney and the Teletubbies.